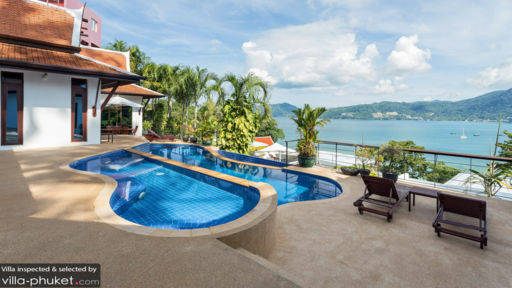 We were a group of friends who had warily booked this villa in Phuket, not knowing what to expect. However, after a gruelling drive from Samui, we were pleasantly surprised by the smiling faces of the maids who immediately made us feel at home. From the start, this villa was everything we expected and more. it was clean, with a scenic view and was just a short distance from the beach. Although it was very hard for us to leave the villa, because of all the amenities it offered, whenever we did venture out on our 3 day stay there, the walk uphill to get to the beach was the only negative aspect of the location i could find. However, it is a small price to pay to get the beautiful, picturesque view while you relax in the pool. All in all, this villa was a fantastic bargain for the price we paid and the staff there was very helpful as well. This villa really enhanced our stay in Thailand and is one of the major reasons why we want to return again. The title more or less sums up our stay at Villa Pra-Nang. The staff at the Villa are extremely service minded. They assisted us with everything. The food they make are better than any restaurant we tried, so if you want good Thai food, stay home! We would especially recommend the BBQ, nice to sit outside and eat while watching the amazing view of Patong. The house was clean, well maintained and had a game room (pool and table tennis) which the kids really liked. We would love to go back to the same Villa if we went back to Patong. We were lucky enough to find this on Trip Advisor however it always shows up as "check with owner for availabilty" Beleive me when i say it is well worth checking with the owner. Anna & Evgeny manage the property for the owner and communication can be a little difficult as we are on opposite sides of the world. But keep persisting as the place is Amazing and well worth the effort!! The property is spotless and kept that way by the lovely maids that service it daily. As they live downstairs they are at your service whenever you need them. As an added bonus they cook your Breakfast (which is included) as well as lunch and dinner if you want. We were there with 2 other families and after already staying in Phuket for 10 nights at a resort in Nai Yang we decided to try Noong's cooking. All you pay is the market prices for the food and she does the rest. We ate out every night prior but once we had tried a meal at the Villa we were hooked. It was the best meals we had eaten in Thailand and unfortunately for my waistline there was always enough leftovers to be reheated for lunch the next day. On our second last night we also has 2 other families staying down the beach come up for a meal. Noong cooked up a storm for all 23 of us, nothing was too much trouble for them. The 5 bedrooms are very spacious all with willl equipped bathrooms. The living areas were large and the games room was a good place to get away from it all, especially for our last 2 days when the weather kept us indoors. The Pool & Spa were great and were cleaned daily, you are also given fresh pool towels daily. We also had use of Sum Dat the driver, he was a lovely man who happily drove you to where you wanted to be and picked you up afterwards. 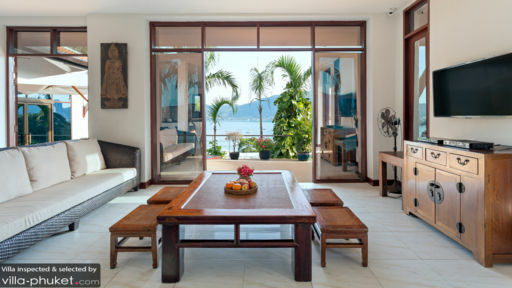 The location of the Villa is perfect just far enough from the ratrace of Patong but with by far the best views. It is only a short 2 minute ride in the car to Patong Beach, there is a convenience store about 150 metres up the hill from the Villa which was good when you needed something extra (usually Beer or Ice Cream!!). This far exceeded my expectations and i can say i was a little hesitant about booking and paying people on the other side of the world by telegraphic transfers. Payment was the most difficult thing about this booking but we sorted that out using paypal and i am so glad we did. 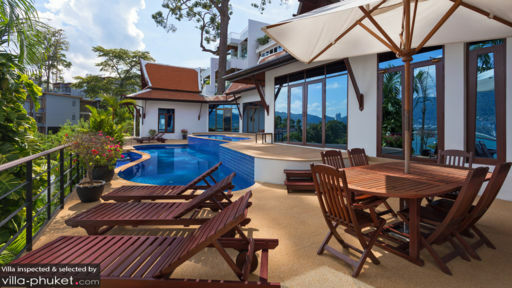 Do yourself a favour, if you have a week in Patong this Villa is Brilliant. It is worth the little extra effort it takes to book it and we will definately be back. The 2 other families we stayed with said the same. It was AMAZING!! !